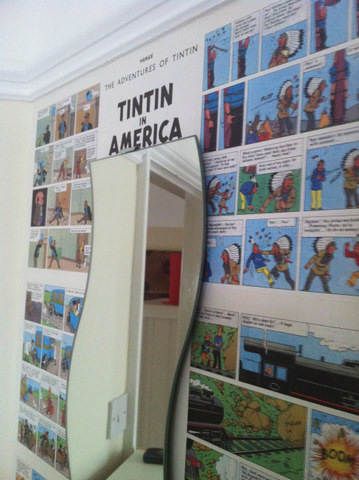 We decorated the boys bedroom a while ago but it was a bit plain so I decided to paper a small section with pages from a Tintin book as an alternative to wallpaper or stickers. This was so easy and the effect was great, I love the muted colours of blue, green and orange. Just shows what you can do with a second-hand book, if you can bear to cut it up! very impressive, some very good ideas, you were only wasting your time sat at a computer. You’ve probably already thought of it but what about screen printing your own wall paper, I know before wall paper walls were lined with decorated fabric, not to sure on the details, say the japanese would be the best to look at. Bean bags are great, really like them. D and O will take one each! Yes, we bought a paperback copy from ebay and used normal wallpaper paste and it worked really well, I’d definitely do it again. My son wasn’t too keen on cutting up the book though! You might need more than one book if the wall is big as we just covered a small corner wall.